How to attract the first 100 customers for your startup using social media? So one day a startup idea hit you harder than that apple hit Newton. The more you thought about it, the more excited you were getting. With time you got people, money, time, courage, crocodile’s tears and the One Ring, and you brought your idea to life. What can be more rewarding than that? Getting your first customer. We’re here to tell you how to find your first 100. They are the most important ones for your future success as the first ones tend to stay with you forever (or so). 1. Don't wait - start selling. Yeah, I know it's scary. You still need to add half of your features, move to a better office, hire more people, and... Still, get out there with your offer and start selling. Act humble and emphasize the fact that you're developing every day. People understand the meaning of startups, and they see advantages and possible disadvantages of purchasing. According to QuickSprout, social media has a 100% higher lead-to-close rate than outbound marketing. It decreases marketing costs by 45%, and 24% of companies that use social media report revenue increases. This stats goes a bit further than simply proving with numbers that almost everyone spends time on social media. I'm not doing the latter just because you know that already. 3. Decide on the portrait of your customer. Are you selling to consumers (B2C)? Are you selling to companies (B2B)? What industries do they operate in? What is the size of these companies? What other related products/services do they prefer? And so on. Now that you know who you’re selling to, start finding these people. 4. Find discussions on online communities and forums. Don’t worry, you won’t have to go to each community and forum and search through them manually - Awario does this for you. Simply set up an alert for the topic you’re looking for. For example, we are selling SMM software, so I went and set up an alert for “Social Media Monitoring tools” and “Social Media Monitoring software” to find relevant discussions. Once you’ve found a discussion on the topic relevant to your product, join it and show your expertise in the topic. Don’t promote your product unless participants ask for such recommendations directly. At this point, you’re building a network of the interested and engaged audience. They need to trust you and know you're an expert in your field. Then when they'll need a product, you’ll have a much better chance of making a sale. Don’t be afraid to be promotional here: post a link to your product and explain why it’s a suitable one to anyone who posts asking for a recommendation. If people are simply discussing your industry, you’d find them with the same “topic” alert you’ve set up before. Follow the “forum” rules then: join the conversation and be helpful. 6. Find your competitor’s unhappy customers. These are the golden warm leads, perfect for the first customers. They wouldn’t want to know “all about” your product, they just really need an alternative. 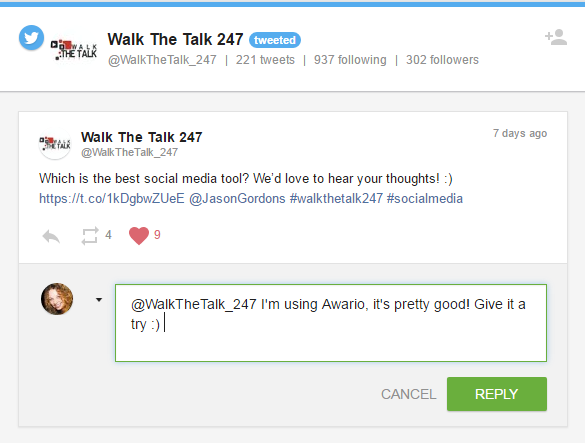 Awario searches through all review sites and all complaints on social media (the number of which are growing every month), so do monitor your competitors and look through mentions of them. Act helpful and explain why your product is better. Social media is rich for online events. There are AMAs, Q&As, webinars, Twitter chats, podcasts, online networking events and whatnot. Don’t ignore any of these - participate. Again, this is a chance for establishing yourself as an expert in your field, and this is the best way to attract the first customers. Find relevant events by monitoring your industry as well. Ask customers to leave a review on your website, Social Media page, LinkedIn, Yelp, Google+ local, or Yahoo local listings. Engage with you customers on social media. Send an email newsletter regularly. Send holiday cards (Birthday, Christmas, 4th of July cards, some important industry holiday - as many as you can). Ask for feedback on social media.